La Quinta Inn Vancouver Airport is a brand new hotel (opened Nov. 2004) with a grand double story atrium-style Lobby, a bell tower centerpiece, and landscaped gardens that complement multiple palm-tree exhibits. 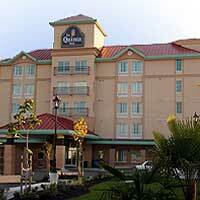 This La Quinta was awarded 1st Place Winner in the City of Richmond 2005 Landscape and Gardens Contest in summer of 2005 (Hotel category). The new hotel is adjacent to Lansdowne Mall, a 150-store shopping complex located in the heart of Richmond's City Center. The new hotel features an Indoor Pool, Whirlpool and Fitness Center, as well as a FREE breakfast with hot Belgian waffles and freshly baked cookies. FREE High Speed Internet Access, FREE local calls and voicemail, FREE airport shuttle from 4am-midnight (Airport 10 minutes from the hotel), FREE parking, and guest laundry facilities are also available to all guests. All rooms feature Simmons Dreamscape Mattresses with 200 thread count bed sheets and marble bathrooms, including marble tub-surround. Movies on Demand, Music on Demand, and Express TV checkout are also available in each room. Our Executive King Rooms feature p-top desks with Hon Ergonomic leather chairs, cordless phones, an armoire cabinet with stainless steel refrigerator, and a 32" television. At La Quinta we have made a special effort to accommodate the needs of the business community by offering free high-speed Internet access in every room, and wireless service in the lobby and breakfast area. Our courteous service, comfortable rooms, and 100 percent satisfaction guarantee will make your stay with La Quinta a comfortable and memorable experience.